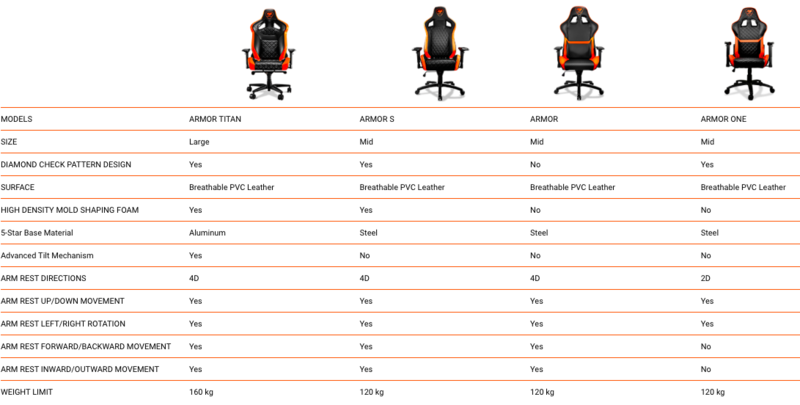 Cougar announced today the arrival of its greatest gaming chair: Armor Titan. Armor Titan excels in many areas. Bigger than most chairs on the market, it accommodates all kinds of body builds. Built with top-end materials, it meets demanding users' requirements. It is highly customizable so it can act both as a professional gaming chair and a soft place to fall on for a nap. Building on the design of the acclaimed Armor series, Armor Titan has been expanded to support up to 160 Kg. This allows an even wider range of gamers to enjoy the legendary comfort of COUGAR's gaming chairs. A new lever enables seamless control of the chair's tilting functionality. Achieving apex comfort has never been easier on a gaming chair. Armor Titan is available now on Newegg.com and will reach the rest of the world markets during September and early October. Its US MSRP is 369.99 USD, and it is available in two versions: orange/black and black. Official Website for Armor Titan can be reached here. If you're interested buying one, take a look at these pages.